The Weaverham Rose Fete dates back to 1927, with bands, dancers and floats from a variety of school and organisations from the village taking part. 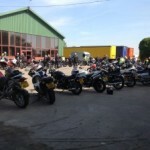 For over 20 years P E Blake & Son have provided wagons and trailers for the procession. Popski’s Private Army was a small, elite unit of the British Army. It was formed in 1942 and fought until the end of the War in North Africa and Italy, specialising in intelligence gathering, sabotage, and partisan support. Friends of Popski’s Private Army was set up to contruibute to the preservation of the Popski story. Managing Director, Michael Blake’s father was a key member of the Popski’s unit. In rememberance, P E Blake have donated funds to enable the creation of their website and a number a plaques at the scenes of Popski’s triumphs. 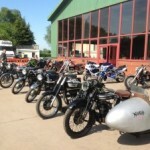 The Manchester Triumph Owners Club was founded in 1963 and is a friendly and active group of enthusiastic bikers who share a love for Triumph Motorcycles. 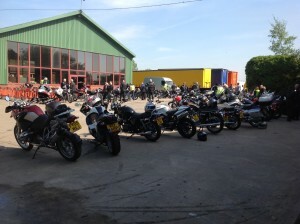 On 26th May, P E Blake & Son provided the location and refreshments for the Bank Holiday Sunday club run. 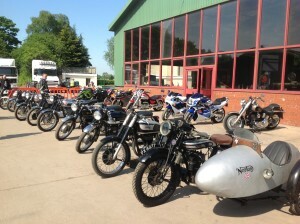 Along with this, the Blake’s collection of classic bikes and cars was brought out into the sun for all to see.